Corfu is in the north and is the most famous Ionian Island. Lefkas is well known for its light cliffs. 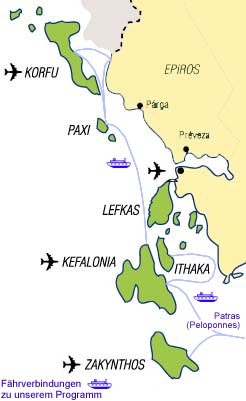 Kefallonia is the largest of the Ionian Islands. Paxos, the Island of the olive trees. Zakynthos, The Venetians called the Island Isola d'ora! Fior di Levante!" which means "Island of Gold, Flower of the East".